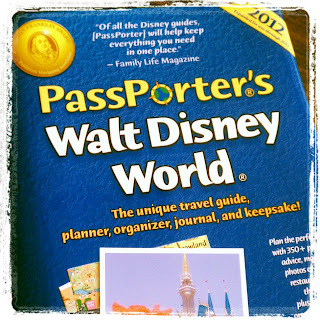 Picturing Disney: Our First Passporter Giveaway! Anyone else obsessed with the awesome, all-in-one guide series known as Passporters? These little lovelies are fantastic and I have a handful to giveaway on the site! I am going to try and be creative so the contests offer readers all different ways to win their own copy of the 2012 Passporter Walt Disney World! I will be reviewing it later this week and you will see our second giveaway opportunity when the review goes live! This one is simple- reply below and tell me "the most magical moment of all" from your last Disney trip (one of my favorite pass-pocket questions). For a second entry comment on ANY other Picturing Disney post!! We were on our first trip to Disney World last May (2011) and we were going to try the Mission: Space ride. When we walked up to go in, one of the workers walks up and says he liked our t-shirts (I made matching shirts for all the parks) and asks if we would like to learn more about the ride. Of course we did, we had no idea what it was! Here we are figuring he's going to explain how it works. No, he took us behind the scenes. We got to go into the control room, on the other side of the window watching everyone who was in line. They told us some facts about the ride, some facts about things in the control room, including where a hidden Mickey was, and we all got to sign our names in a book that all guests who go in there get to sign! When we were done with the short tour we got to go straight to the front of the line. When the ride was over the same worker was waiting for us and gave us a handful of Fast Passes that were good for 3 of the rides in Epcot! Needless to say, Disney World for the first time is special enough but this just made our day!!! Watching my 4 year old daughters face on her first ride on Tower of Terror. We flagged down a Photopass Photographer as soon as we got off to get the most perfect shots of her proud face! Our last trip to Disney World was a quick weekend visit to celebrate my son's 10th birthday. We arrived on a Friday, his actually birthday, and after checking in at POFC we headed to Fort Wilderness for the Hoop-De-Do-Review. It wasn't so much one moment as the whole experience of watching my son see Fort Wilderness for the first time. See, that was where my family stayed about every time we went to Disney, and it had so many good memories for me that seeing how intrigued my son was by everything from the stables to the lawnmower tree just melted my heart. Having my high school best friend attend the trip for her very first time to Disney World with us. Just seeing how she's enjoying herself there and riding the rides next to her and keeping those secrets for the shows like the one at "It's Tough To Be A Bug" at Animal Kingdom, and kept the secret that there was going to be an smell during the show and having her tell us why she wasn't told, now that was fun. I have to honestly say that the whole trip was magical! It was the first time my Husband and Son had ever been to Disney. Everything from eating at The Royal Table to Turtle Talk with Crush, eating at Le Cellier & Akershus, my 8 month old son drooling over Goofy, and just all of the quality time our family was able to spend together. We were able to celebrate my Husband's birthday and Father's Day during this trip. It was such a magical experience :) and of course we used our Disney PASSPORTER :)!! I would love a new updated copy!! Spending time with my sister, showing her all the "best things" at Hollywood Studios, especially THE TOWER OF TERROR!!!! We went to Daytona Beach this past Thanksgiving and my husband surprised me with a day at the parks. We hit AK first and had a couple hand us two fast passes for the safari, which was so nice! Then we got to Expedition Everest and had a 10 minute wait! Of course leaving we stopped in the shop and I got two new park 7 vinylmations neither of which I had. We decided to head to Epcot for lunch and got into Nine Dreagons with no ADR! After lunch we walked through World Showcase and stopped in Paris for a Grand Marinier slush. Of course we topped off Epcot seeing Mickey and Pluto and riding Soarin. We closed our day at Downtown Disney people watching...it was a perfect day! My last trip was about a month ago and I went to Hollywood Studios with my little sister. We hadn't been to Disney since we were really little. There is a 6 year difference in age between us but we are best friends. This was the first time that we went to Disney just the 2 of us and we had a blast the whole trip. We went to Hollywood Studios and we knew we wanted to go on the new Toy Story ride. So when we got in line it was pretty long. Well we got up a little bit more and since it was just the two of us they put us in the fast-pass line. We got to go right to the front of the ride. That seemed to happen to us all day. I don't know if it's something that normally happens but it made our day so much more magical because we got to go on a lot more rides and make a lot more memories. Seeing the picture of my 5 yr olds face when you get off of splash mountain. I will never forget the look on her face, she was both terrified and smiling at the same time. She wanted get right back on and do it again. I was able to take my niece to Disneyland for the first time last summer and seeing her watch the parade actually brought tears to my eyes. Knowing how much fun she was having at MY absolute favorite place really warmed my heart. It was amazing to be able to share that first with her. Riding with my 4 year old for her birthday on Splash Mountain. She was so scared, the entire time, and when we finished, she said "Where's the big hill??" I laughed- it had been so much bigger in her mind than what the real one was, she didn't even realize we were going down it! I have not been there in 18 years. We are planning our first family trip and my kids cannot wait to go. My favorite moment as a child in Disney was watching the fireworks on my Dad's shoulders every night and taking the boat back to fort Wilderness. It was a magical moment for sure! Getting to spend some mother-son time with my teenage son during EMH @ MK! Those with teenagers will understand. My most magical Disney moment was when I was around 11 and the wishing well at Disneyland sang us a song when my friend and I dropped in our pennies! That would have been back in 1985 or so. My mom went a few years ago and tried to show my grandmother how it worked, but it wouldn't sing for her. She had to ask a Cast Member for the secret. On my 19th Birthday, my mom took me on the Keys to the Kingdom Tour. The story of the picture of Roy Disney with Mickey at the park's opening brought us both to tears. That if Roy could have Walt there with him, he'd like to have the next best thing. My family's first trip to WDW is coming up in September, so unfortunately I don't have a magical memory of our last trip. So far in planning this trip though, the best moment is envisioning how my kids will react when we tell them. Commented on another blog post for second entry. We took my niece to Akershus for her first character dining experience. She loved spending time with the princesses and getting a chance to talk to them without waiting in line. Belle was the sweetest and chatted with my niece for several minutes, listening to everything she said. It was a wonderful experience. Our one year old was having his first trip to WDW, and he was so excited about the whole experience. One night for dinner, we went to Chef Mickey's. All the characters were wonderful, of course. Minnie signed my kids' autograph book and wrote a special note to my son about how happy she was that her name was his first word (yes, some parents get "mama," but we got "Minn-uh! "), Goofy was goofy, etc. Then Mickey came around, and my son kissed him, which Mickey loved. And then he kissed him again. Mickey started pointing to his face, and the baby would kiss him on demand! When Mickey left, he kept stopping by the table, pointing to his face, and getting a kiss. I am not exaggerating when I say we have thirty or more separate kiss pictures! When people say they don't think a baby can enjoy WDW, I just show them the pictures of his delighted face! My family and I are planning our 1st trip in June, so I don't have any special memories. I can't wait to make wonderful, lasting memories with Mickey and the gang! I'd have to say the fireworks at the Mickey's Not So Scary Halloween party in Magic Kingdom. I've never seen anything like them! I'm glad our friends we were with got us to go in front of the castle. It was so awesome!! Arriving home, after a 3 week vacation to WDW, DISNEYCRUISE and DISNEYLAND to find out we were Pregnant. Our very own little disney souvineer! Last fall I visited Disney with my daughter and her family; we stayed at Animal Kingdom Lodge for the first time. My 4 y/o grand daughter was so excited everyday looking out from our balcony at the animals; she would fling back the curtains at the break of dawn just when the sun was rising and we would all wake to her squeals of look look at the animals come see everybody it was precious and a trip I will never forget! Our magical moment was having our youngest son's first haircut done at the barbershop in Magic Kingdom just after his first birthday. It was a great way to capture one of his memorable fisrts! My most magical moment of last year's trip was watching my two kids with my dad... we spent the whole week together and i figured by the end of the week he would be a little worn out (4 year old girl and 18 month old boy)..my husband and I walk out of Mouse Gears and he's just sitting there hugging my son with a huge smile on his face listening with rapt attention to a story my daughter is telling him as she's bouncing and spinning around..He's following everything she said like it's the most thing in the world (and like he wasn't there when it happpened) and the joy on everyone's face just makes me smile everytime I think of it..
Our last trip was our first with friends who had never been to Disney. Seeing the excitment on their kids' faces was like experiencing my kids' first trip all over again. My favorite moment from our last trip was when we met up with my best friend and my son and her daughter instantly became best friends. They held hands and walked around together like they'd known each other forever, though they'd last met when he was only 6 months old! Watching them discover the magic together was awesome. My daughters and I were at the tea at the Grand Floridian and we saw the horse and carriage go by with a young bride! They were on their way to the Wedding Pavilion. We had a wonderful experience at Magic Kingdom. My daughter was celebrating her birthday and she had on her birthday button. We stopped in to get lunch at the Main Street Bakery. The cashier saw Maddie's button and gave her a very large cookie and came to sing Happy Birthday to her. Later the same day, we were at the Lunching Pad and the cashier saw Maddie's button and gave her a turkey leg and a bag of chips. She had a most wonderful day and loved getting the attention. I left comment on Part 4 2007: Surprise Illuminations! The last time I went to Disney was July, 2011 with my mom. It was just for a long weekend to celebrate my mom's birthday and visit her fave park EPCOT. I made sure to obtain her a birthday button immediately when we arrived. The most magical of all was walking through EPCOT, and having everyone, cast members and visitors alike wish her a Happy Birthday, give her little things like free ice cream, cookies, and even a fast pass! It was so wonderful seeing her face, I could have not rode one ride and had the best time ever watching her. We went on a Disney Cruise last year. My daughter has food allergies. They assigned her a personal Chef. He was FABULOUS!!!! He would always try to help us make sure that our daughter had the best experience. So, he gave us a lot of pointers about the ship and activities. On the last day I had mentioned to him that she was upset because she hadn't gotten Belle's or Peter Pan's autograph yet. I didn't think much of it, I was just telling him why she was bummed. That night... the last night of the cruise, we got a phone call at about 10pm from our fabulous chef. He told us to run up to a lounge right then! When we got there, he was in his full officer uniform and he invited us into a private party. All of the characters were in the lounge. There were only a few families in there. She got to spend the next 15 minutes dancing, taking pictures with and getting autographs from all the characters. It was truly the best possible ending to the cruise. Thanks Chef Corey!!!! It was my children's first trip to Disney world. We walked onto Main street , got our buttons from city hall and just happened to walk out as Snow White was getting ready to greet guests. We were 2nd in line and my daughter (6yrs old) was amazed. She talked with her and chatted, got her picture taken and when asked by Snow White, "Where did you come from?" My daughter looked at her strangely and answered, "My mother!". We all laughed and Snow White totally in character, giggled and said, "Why of course you did!". It was a perfect little moment we will always remember.